At 60 km from Geneva, joining Plateau d'Assy. 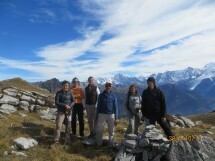 In continuation of the Tour of Fiz, traveled there two weeks hiking in a wilderness environment. Climb to the chalets of Varan, and the pastures, we reach the pass of Barmerousse (2250m). Constant panorama of the Mont Blanc. A circular route.